Anne of Austria [1601-1667]was the wife of King Louis XIII of France. The Queen is represented at about the age of twenty-five, dressed with a "Medici" pleated lace ruffle around her neck and a jeweled crown on her head. 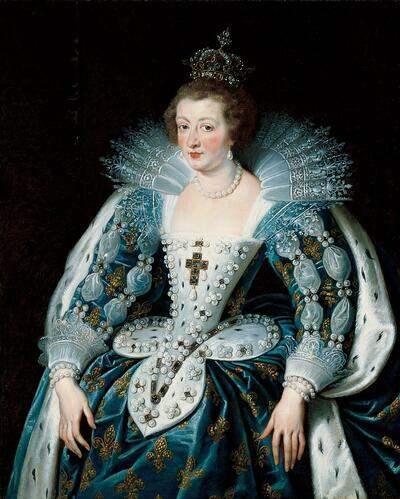 The satin dress is embroidered with repeated fleur-de-lys, and she wears an ermine-lined mantle. The portraits of Anne and Louis were probably painted during one of Rubens' visits to Paris when he was directing the decoration of the Luxembourg Gallery. Wilhelm II (1859-1941), King of Prussia and Emperor of Germany, Charlottenburg. Hohenzollern Family (family of Wilhelm II) c. 1933.